1) It was rumored that when she went to Taiwan in August 2010, Shin Hye threw away some presents that fans gave her. In response to that, Shin Hye said that she never did that. Actually, she heard about that for the first time today. She said she is really sorry and that she will communicate with staff next time to prevent such happenings in the future. 2) Shin Hye said that she always brings all presents from fans back to Korea because the fans put in a lot of love and effort into the presents. She likes hand-made presents the most. At home in Korea, she has a 'fan wall' where she sticks all fans' postcards/cards/drawings on. 3) George revealed that Shin Hye is a very considerate person. During filming, she would walk up to fans to receive presents personally. 4) During her 3-day stay in Taiwan, Shin Hye went to eat 'chili hotpot' which she loves. But necause of the extremely spicy food, she had a stomachache the day after. Yesterday (June 13), she had some free time at night and went for a foot massage as well as shopping/eating at a night market in Taipei. She misses Kenting. 5) This morning (during the filming), Shin Hye made breakfast for George which surprised him. He said that he wants to eat Shin Hye's homemade toast. Shin Hye said that at home, she always cooks breakfast when she is free. 6) Shin Hye is very talented at cooking Hansik (Korean cuisine 한식). She can cook almost all types of Hansik. 7) While she was filming Hayate in Taiwan, she always bought groceries from the market and cook dinner. 8) George made a sandwich for Shin Hye. She said it's very tasty and gave him 100 marks. 9. The three of them talked about 'weird fan presents' that they had received before. Shin Hye said she once received a Cheongsam(traditional chinese dress) from fans, but the opening on the thigh area is too high.. so she has never worn it despite the beautiful craftsmanship. 10. Shin Hye learned how to cook hansik from her mother. Her best dish is Korean Spicy Chicken Stew (닭볶음탕). 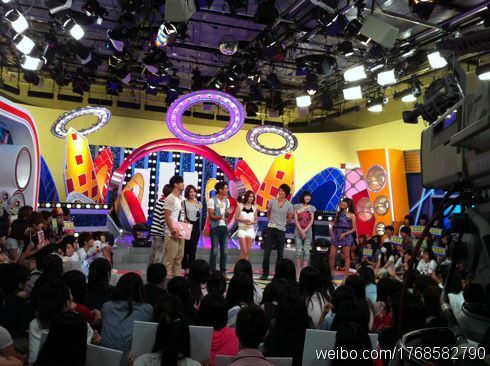 Afterward, the cast went to GTV for tv show 'Entertainment 100%' filming. The episode will air this Sunday, June 19. Completing all her Taiwan schedule, Shin Hye left Taiwan for Korea at around 5pm. She will be going to Jeju Island tomorrow for 'Heartstrings' filming with Yonghwa. Please support Hayate and Heartstrings!! awwwwwwwwwwww I love love love love love Shin Hye! She's such a lovely and considerate girl and she's going to be a wonderful mom later. I wish I knew how to cook. Beautiful and talented! Love! And she's sooo pretty in the clips. I can't wait to watch Hayate this Sunday!! !